auto immune reaction thus, saving their lives. Anaphylaxis is defined as "an acute, potentially life-threatening hypersensitivity reaction, involving the release of mediators from mast-cells, basophils and recruited inflammatory cells. 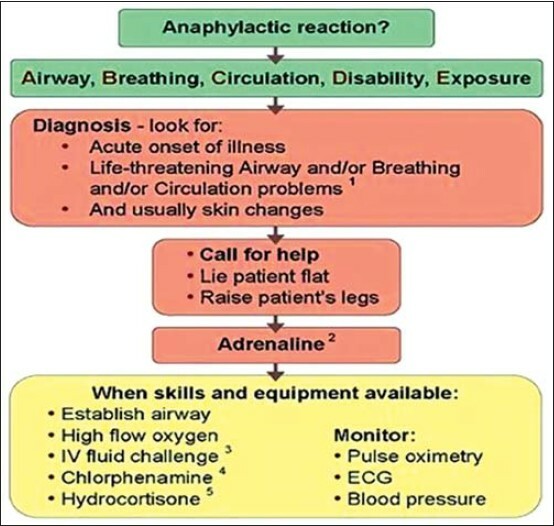 Anaphylaxis is defined by a number of signs and symptoms, alone or in combination, which occur within minutes, or up to a few hours, after exposure to a provoking agent. It can be mild, moderate to severe, or severe. Most cases are mild but any anaphylaxis has the potential to become life-threatening" (World Allergy Organization). Anaphylaxis develops rapidly, usually reaching peak severity within 5-30 min, and may, rarely, last for several days. All dental practitioners should be aware of the diagnosis and management of emergencies such as anaphylaxis that may arise from the use of local anesthetic agents in their clinical set up. Resuscitative drugs such as antihistamine, adrenaline and corticosteroids should be available at chair side for immediate use. All patients must be warned prior to local anesthetic agent administration of the possible danger that follows its use. They should be told to report back immediately to the clinic if a rash should develop. Anaphylaxis may develop immediately and is usually immediately life-threatening due to respiratory embarrassment. Early symptoms and signs include a sensation of warmth, itching especially in the axilla and groin, and a feeling of anxiety and panic. These may progress into an erythematous or urticarial rash, edema of the face and neck, bronchospasm and laryngeal edema. Asthma and other respiratory diseases. Initial exposure to the allergen by injection (intravenous [IV] medication). Frequent exposure to the allergen, particularly if exposure is followed by a long delay and then a re-exposure. Airway: Look for and relieve airway obstruction; call for help early if there are signs of obstruction. Remove any traces of allergen remaining. Give high-flow oxygen using a mask with an oxygen reservoir. Breathing: Look for and treat bronchospasm and signs of respiratory distress. Circulation: Colour, pulse and blood pressure (BP). Disability: Assess whether responding or unconscious. Exposure: Assess skin with adequate exposure, but avoid excess heat loss. Consider anaphylaxis when there is compatible history of rapid onset of severe allergic-type of reaction with respiratory difficulty and/or hypotension, especially if there are skin changes present [Figure 1]. Lie the patient flat: Raise the legs (care, as this may worsen any breathing problems). In pregnant patients, use a left lateral tilt of at least 15°. If the person is conscious: Dentists should place them in a position where they are comfortable and able to breathe easily until the ambulance arrives. If they are feeling faint, they should be laid flat with their legs elevated, if possible. Adult IM dose 0.5 mg IM (=500 μg = 0.5 mL of 1:1000) adrenaline (epinephrine). >12 years: 500 μg IM (0.5 mL) that is, the same as the adult dose. 6-12 years: 300 μg IM (0.3 mL). <6 years: 150 μg IM (0.15 mL). If the child is small or prepubertal 300 μg (0.3 mL). Note: IV adrenaline (epinephrine) should only be administered by those having the necessary training and experience such as anesthetists, intensivists and emergency department physicians. Establish airway (in anaphylaxis, airway obstruction from tissue swelling is difficult to overcome and early expert intubation is often needed). Intravenous fluid challenge: Insert one or more large-bore IV cannulae (enable the highest-flow). Use intraosseous access (if trained to do so) in children when IV access is difficult. Give a rapid fluid challenge: Adults - 500 mL of warmed crystalloid solution (e.g., 0.9% saline) in 5-10 min if the patient is normotensive or 1 L if the patient is hypotensive. For children - give 20 mL/kg of warmed crystalloid. Note: Use smaller volumes (e.g., 250 mL) for adult patients with known cardiac failure and use closer monitoring (listen to the chest for crepitations after each bolus). The use of invasive monitoring, e.g., central venous pressure can help to assess fluid resuscitation. Isoproterenol (pure beta-agonist): In patients taking beta-blockers adrenaline would be less effective. Give epinephrine first. If the patient is not responding to epinephrine, use isoproterenol (1 mg in 500 mL). Continuing respiratory deterioration requires further treatment with the bronchodilators, such as salbutamol (inhaled or IV), ipratropium (inhaled), aminophylline (0.25-0.5 g IV). 12 years and adults: 10 mg IM or IV slowly. 6-12 years: 5 mg IM or IV slowly. 6 months to 6 years: 2.5 mg IM or IV slowly. <6 months: 250 μg/kg IM or IV slowly. Diphenhydramine: 50 mg or 1 mg/kg IV slowly repeated if necessary. Glucagon: Atropine or glucagon IV if the patient is on beta-blocker failing to respond. >12 years and adults: 200 mg IM or IV slowly. >6-12 years: 100 mg IM or IV slowly. >6 months to 6 years: 50 mg IM or IV slowly. <6 months: 25 mg IM or IV slowly. In adults: A systolic BP > 100 mm Hg. In children: 0-1 month: Minimum 50-60 mm Hg. >1-12 months: Minimum 70 mm Hg. >1-10 years 70+ (age in years × 2) mm Hg. The patient may need to stay in the hospital for 24 h to make sure no new symptoms occur. For a severe reaction, the doctor may monitor heart function or admit the patient to the intensive care unit. When time allows, take a full history from the patient (relatives, friends, and other staff). This should include documenting all symptoms in full, so as to confirm the diagnosis. In particular, record the time of onset of the reaction and the circumstances immediately before the onset of symptoms. Review the patient's notes and charts. Study both absolute and trends of values relating to vital signs. Check that important routine medications are prescribed and being given. Review the results of laboratory or radiological investigations. Refer to an allergist or allergy clinic to try to identify the allergen, so that it can be avoided in the future. Organize self-use of preloaded pen injections for future attacks (e.g., EpiPen) containing 0.3 mL of 1 in 1000 strength (that is, 300 μg) for adults and for children 0.3 mL of 1 in 2000 (150 μg). Some dentists are not aware of this emergency vital clinical condition. Therefore, dentists should develop their knowledge on this subject of the anaphylactic shock management, to prevent this life-threatening event. 1. Worm M. Epidemiology of anaphylaxis. Hautarzt 2013;64:88-92. 2. Worm M, Babina M, Hompes S. Causes and risk factors for anaphylaxis. J Dtsch Dermatol Ges 2013;11:44-50. 3. Przybilla B, Ring J, Ruëff F. Anaphylaxis. Clinical manifestations and diagnosis. Hautarzt 2007;58:1025-31. 4. Bartolomei FJ, McCarthy DJ. Anaphylaxis: Mechanisms, manifestations, and management. J Foot Surg 1984;23:485-8. 5. Michalska-Krzanowska G. Tryptase in diagnosing adverse suspected anaphylactic reaction. Adv Clin Exp Med 2012;21:403-8. 6. Chiu CY, Lin TY, Hsia SH, Lai SH, Wong KS. Systemic anaphylaxis following local lidocaine administration during a dental procedure. Pediatr Emerg Care 2004;20:178-80. 7. Vervloet D, Magnan A, Birnbaum J, Pradal M. Allergic emergencies seen in surgical suites. Clin Rev Allergy Immunol 1999;17:459-67. 8. Laxenaire MC. Again and always allergy. Ann Fr Anesth Reanim 1999;18:831-3. 9. Hepner DL, Castells MC. Anaphylaxis during the perioperative period. Anesth Analg 2003;97:1381-95. 10. Lieberman P, Camargo CA Jr, Bohlke K, Jick H, Miller RL, Sheikh A, et al. Epidemiology of anaphylaxis: Findings of the American College of Allergy, Asthma and Immunology Epidemiology of Anaphylaxis Working Group. Ann Allergy Asthma Immunol 2006;97:596-602. 11. Webb LM, Lieberman P. Anaphylaxis: A review of 601 cases. Ann Allergy Asthma Immunol 2006;97:39-43. 12. Dewachter P, Mouton-Faivre C, Emala CW. Anaphylaxis and anesthesia: Controversies and new insights. Anesthesiology 2009;111:1141-50.